§ Best Community Building/Volunteerism or Activism Campaign: Peace x Peace, whose mission is to connect individuals and Circles of women everywhere in the world, through the Internet, for spirited conversation and mutual support. They also have a (often disturbing) blog at Week X Week. 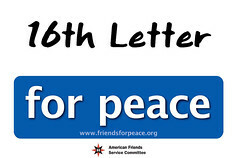 § Best Integrated Online and Offline Campaign: The American Friends Service Committee (AFSC) won this award with their Friends for Peace campaign, which encourages you to upload your “peace” sign, or make your own at their Web site. § Best Special Event Registration and/or Membership Campaign: Gulu Walk, which is focused on supporting the abandoned children of northern Uganda, coordinated 30,000 people to walk in 2006. The organization’s 2007 walk is coming up on October 20th. § Best Online Donations/Fundraising Campaign: Mama Cash, a Netherlands-based organization with a women’s fund that finances projects conceived by women, won the award for Campaign 88 Days, an effort to convert young, affluent women into donors and advocates for women’s rights. During the 88 days, the campaign raised more than $200,000.